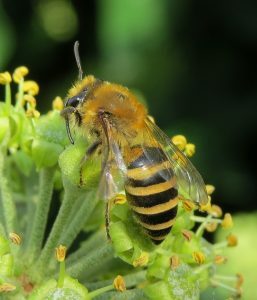 Ivy mining bees are relative newcomers to the UK, first spotted in 2001. They can be seen in autumn, coinciding with the flowering of Ivy, which, as their name suggests, is their main food resource. These bees are medium to large (just bigger than a honeybee), with ginger thoraxes and distinct orange/yellow striped abdomens. Females are slightly larger than a honeybee, with densely haired ginger thoraxes and broad orange/yellow striped abdomens. Their size and banding separates them from similar species in the same group (known as Plasterer bees). Males are similar to females, but smaller. They are difficult to distinguish from other male Plasterer bees though, particularly the Sea Aster bee (Colletes halophilus) and the Heather Colletes bee (Colletes succictus). The late flying period and association with Ivy flowers can help narrow things down though. Common in urban and farmland settings, as well as coastal and heathlands. This species is known to nest in exceptionally large and densely packed groups. These mainly occur on south-facing slopes of sparsely vegetated and bare earth, although are also known to occur in garden lawns and allotments. As the name suggests, this species predominantly feeds on Ivy flowers, but they will also visit a variety of late blooming flowers. 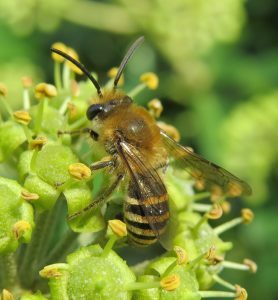 The last solitary bees of the year, males appear in late August, with females typically a month later, persisting into November. 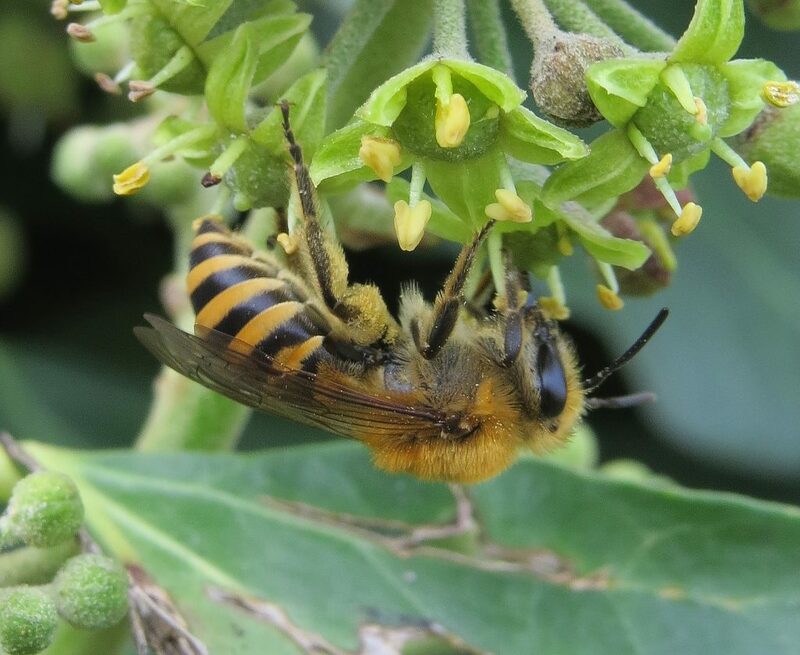 Having arrived in Dorset in 2001, these bees have spread throughout the south coast of England and have expanded northwards into south Wales and Shropshire in the West and Norfolk in the East. As soon as the females start to emerge the males take their opportunity and compete with each other to father the next generation. The contest is fierce with many males attempting to mate with the same female and becoming entangled in what is called a ‘mating ball’. With so many bees nesting in close proximity, the total effect of this frenzied activity can be quite impressive.